Click on this image to link to Dawn's blog. She also has a great video tutorial for this fun-fold. Welcome to the Crazy Crafters Blog Hop with our Special Guest stamper, Dawn Griffith - we are thrilled to have Dawn join us this month and so excited to CASE (Copy And Selectively Edit) any project that has been created by Dawn. We hope you find great inspiration from the projects. 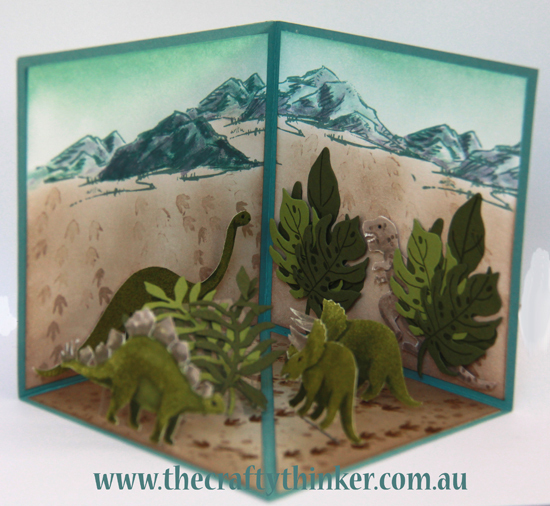 I chose to CASE this Pop Up Corner card by Dawn but have put a rather different spin on it. When my son was young and fascinated by Dinosaurs, we used to play a computer game together (back in the day of the floppy disk!) where we went looking for dinosaurs in various eras to take a photo of them. It was so much fun! 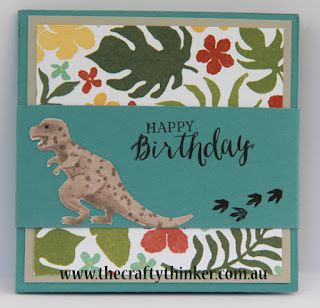 It's no surprise, then, that I love the No Bones About It stamp set! 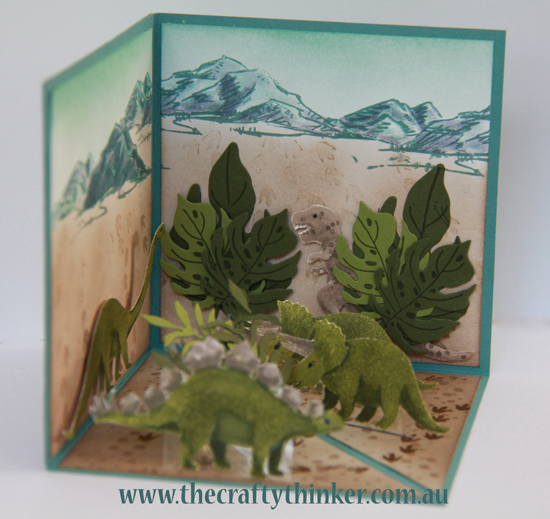 Since its introduction I've enjoyed creating many little dino-scenes but I think I like this one the best. The dimensionality of the card, makes it quite hard to photograph! When my son (now 23 years old!) saw the inside of this card, he just loved it! He said he'd love to be 7 or 8 years old again because it would be the ultimate birthday card! High praise! Can you spot the danger lurking? There seems to have been a migration down from the mountains! 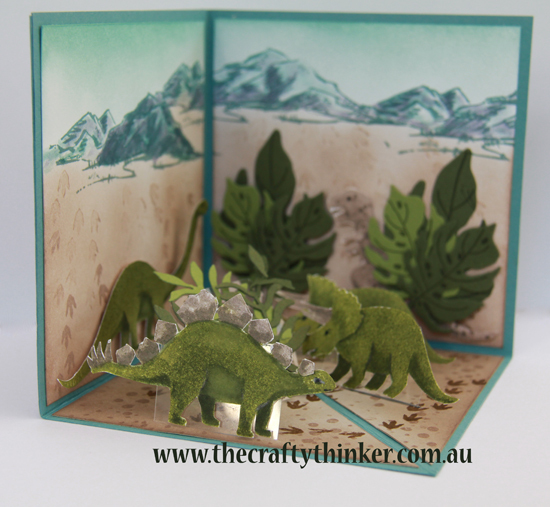 The Triceratops couple and the Stegosaurus seem blissfully ignorant of the lurking danger! Thank you for visiting my Jurassic world today!